Research has found that businesses with an emphasis on sustainability see a positive return not just in customers’ perceptions, but in financial terms. A Nielsen study of consumer attitudes across 60 countries found that 55% of consumers would pay a premium for products and services offered by eco-friendly and socially responsible companies. Modern restrooms are considered sustainably designed when they use durable materials that will not need frequent replacement, are recyclable/recycled, and have a low environmental impact. 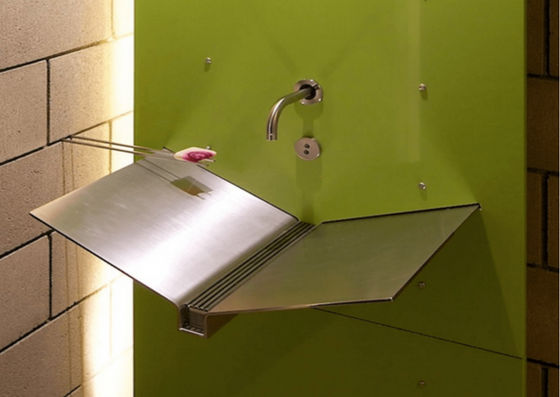 Many options exist for fixtures that reduce water consumption and energy use and also often contribute to green building programs such as LEED. 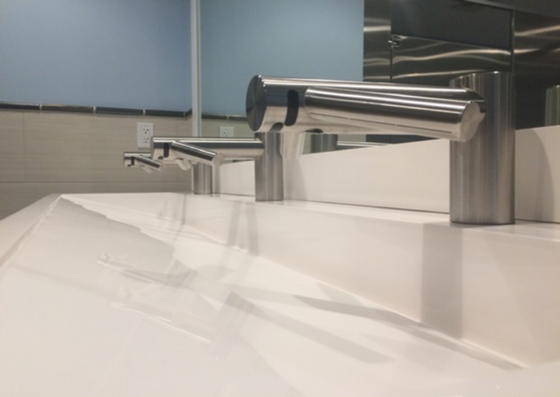 Custom 10’ THREE station System M2 integrated shelf with integrated sensor operated faucet, deck mounted soap and integrated waste receptacles installed at Spago’s Restaurant at the Forum Shops at Caesar's Palace in Las Vegas. Sinks and countertops meeting a modern minimalist design aesthetic are made of sleek and elegant materials such as stainless steel, cast resin, and solid surface. Not only is stainless steel a durable, impact-resistant, resilient, and long-lasting material, it is also 100% recyclable. Recycled steel makes up about 60% of any stainless steel object, and some manufacturers use up to 80% recycled steel in their basins and countertops. 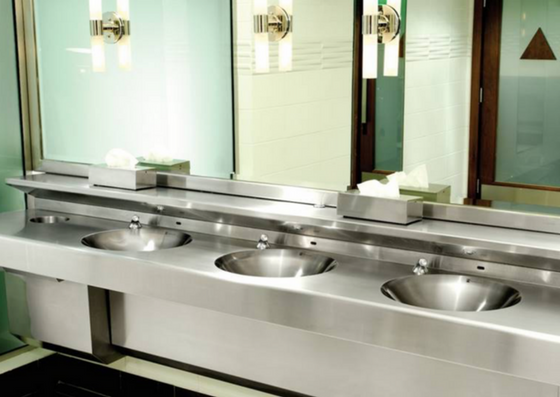 Stainless steel is extremely strong; look for 16- or 14-gauge stainless for the strength needed to last in a commercial or hospitality restroom installation. With correct cleaning and maintenance, stainless steel sinks and countertops will last for years. Solid surface is eco-friendly and uses a minimum of 15% post-consumer recycled material that would otherwise have ended up in a landfill, as well as a minimum of 5% rapidly renewable material derived from bio-based sources such as soy and corn crops. Solid surfacing is resistant to chips, cracks, impact, scratches, heat, chemicals, and stains, and is Class A fire rated. It is durable and can be quickly repaired or refinished. Cigarette burns, permanent marker, and minor scratches can be removed with a sander or a non-scratch scouring pad. Unsaturated acrylic and polyester resin is a durable material that can be cast into any size or shape in molds, allowing highly customizable and unique pieces. 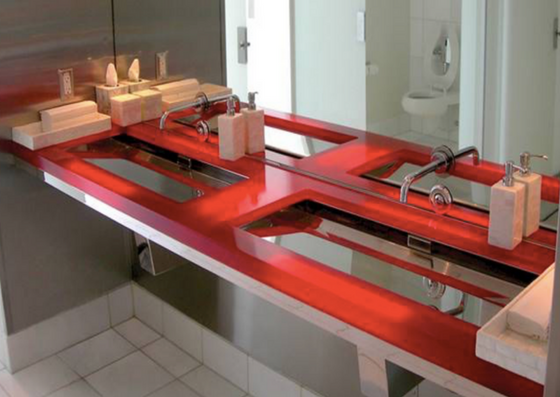 Resin countertops are in wide use in laboratories because of their resistance to stains, impact, scratches, and heat, so they are well suited for the high-traffic public restroom environment. If needed, the surface can be refinished instead of replacing the entire unit. 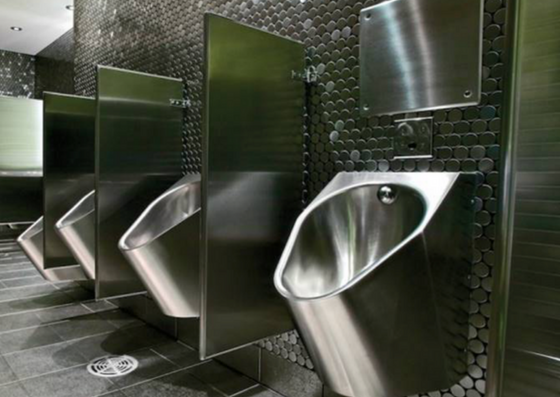 Corrosion-resistant recycled and recyclable stainless steel is a durable choice for toilets and urinals. Look for welded pieces that maintain their integrity and strength in high-traffic areas, and contain 80% recycled content. The federal water use standard for toilets is 1.6 gallons per flush (gpf), and for urinals, 1.0. High-efficiency toilets with the WaterSense label use only 1.28 gpf; high-efficiency urinals must use no more than 0.5 gpf. High-efficiency toilets and urinals can contribute points to the Water Efficiency (WE) category in LEED v4. Environmentally friendly faucets and hand dryers emphasize a commitment to sustainability through water- and energy-saving features. The Energy Policy Act of 1992, EPAct 92, set the private lavatory faucet federal standard for water volume at 2.2 gallons per minute (gpm) and the public faucet federal standard at 0.5 gpm. Private fixtures are those in residences, hotel guest rooms, and private hospital rooms. All other applications are public. WaterSense, a partnership program by the U.S. Environmental Protection Agency, seeks to protect the future of the nation’s water supply by labeling products and services that have been certified to be at least 20% more efficient without sacrificing performance. WaterSense-labeled bathroom faucets (for private use, which includes hotel bathrooms) use a maximum of 1.5 gpm. Public lavatory faucets are not labeled by WaterSense, but a multi-spray laminar aerator reduces the water volume from the federal standard of 0.5 to 0.35 gpm. Neo-Metro basin featuring the Dyson Airblade TAP (Wash and Dry). Hold your hands under the center of the tap to wash, then raise your hands directly under the tap arms to dry your hands in just 14 seconds all without having to turn a knob or push a button. Show your employees, customers, and guests that you care about the environment as much as you care about their comfort and experience, by choosing design friendly and sustainable products. 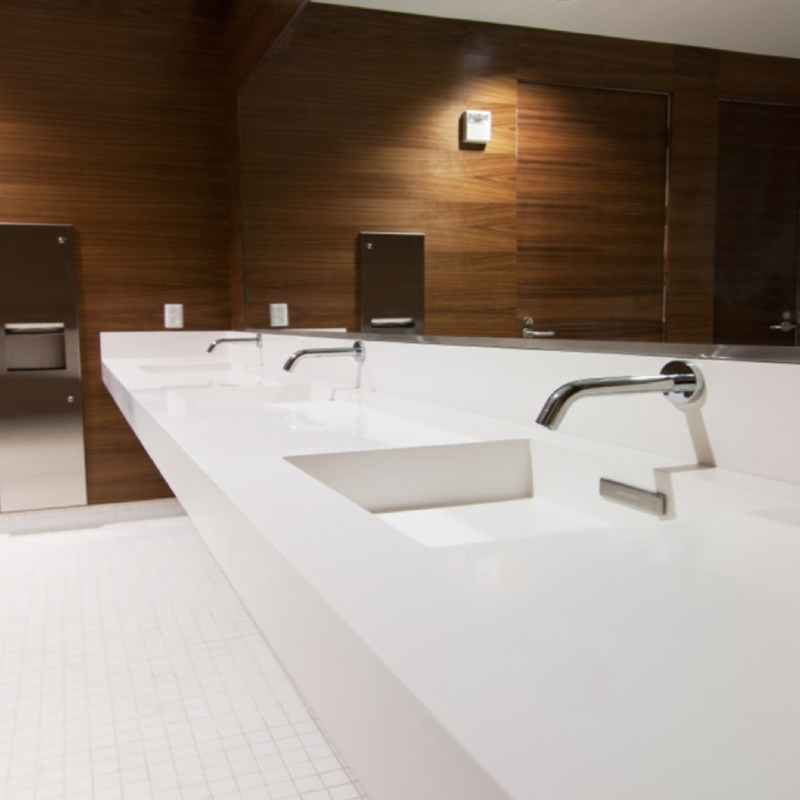 For more ways to make your restroom more appealing to the public and your employees, please read our tips on Hygienic Bathroom Design, Vandal Resistant Bathrooms, and Universal Restroom Design. For more information about Neo-Metro and our luxury plumbing products intended for commercial, hospitality and residential applications, please contact us. You can also visit our product pages or search by application. The Four Most Important Design Trends for Commercial RestroomsBathrooms are no longer an afterthought in commercial buildings, and smart owners are using popular ...Commercial Bathroom Design That Deters VandalismExplore different ways you can deter restroom vandalism through design, including creative ways to e...Impress Your Guests with Clean, Hygienic Commercial Restroom DesignPublic and commercial restroom design tips that help you keep your bathrooms clean and hygienic.